Although diamonds have long been the traditional stone in engagement rings, gemstones have been experiencing a boom in popularity of late. Many concerns, from issues with so-called “blood diamonds” to price concerns, have led engagement ring buyers to seek out unique choices among gemstones. Diamonds tend to be more expensive than gemstones due to De Beers’ near monopoly on the stones. This means that, though diamonds cost significantly more than other stones, they may not be particularly rarer or more beautiful than other types of gems. In addition, a number of diamonds have been found to be sourced from wars and other conflicts, meaning their purchase likely financed violence in the country where they were mined. Gemstones possess a number of advantages over standard diamonds when used in engagement rings. Hundreds of types of gems can be used in engagement rings, each with its own unique characteristics. Gems also occur in virtually any color imaginable, making them a great choice for anyone looking for a unique engagement ring to present to a fiancee. Another popular reason for choosing gemstones is for personal meaning. Whether it’s a birthstone, comes from a meaningful location, or is a favorite color, a gem can offer more meaning than a standard diamond ring. Gemstones also make for unique rings, which make them popular choices among people who like to stand out from the crowd. An engagement ring with a gemstone at its center can be an interesting conversation piece or a stunning work of art, or both. Ruby, emerald, and sapphire are all very popular choices for gemstone engagement rings. 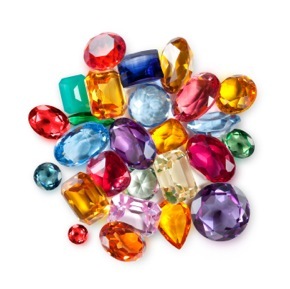 Other choices include amethyst, topaz, citrine, aquamarine, tanzanite, and garnet. Several types of gems, sapphire in particular, may take on a wide range of colors depending on their chemical makeup. Many of the less expensive stones are still beautiful, making them good choices for the budget-conscious buyer. One factor to think about, however, is longevity: some stones are relatively soft and may not hold up as long as the marriage. Longevity is one advantage diamond has over gemstones; however, many gems are nearly as resilient as diamond. Sapphires in particular are extremely hard. The cost of a gemstone engagement ring can vary within a huge range. The price usually depends on the rarity of the particular gemstone type. In addition, some types of gems require more labor to prepare for placement in a ring, so such stones often cost more. In general, though, gemstones are significantly less expensive than diamond engagement rings. A cursory search reveals the price range for gemstones to be from two hundred to three thousand dollars, at least online. Of course, individual stores may carry cheaper or more expensive bands. For comparisons sake, the same search reveals diamond rings costing from nine hundred to well over fifty thousand dollars. The price of diamond rings is driven up significantly by the ‘status’ effect of diamonds: people believe that diamonds are worth quite a bit more than they really are, and so stores are able to charge very high prices for diamonds. This effect is generally absent in gems, which means that careful shoppers can find beautiful rings at affordable prices. There are a number of good options for places to purchase a gemstone engagement ring. Obviously, traditionally jewelry shops are a good place to start; however, they may be more expensive than other options and carry a small selection. Another place to look is online marketplaces, such as Amazon and many jewelry websites. Although websites tend to be less expensive than brick and mortar stores, they don’t grant the buyer the opportunity to see what the ring looks like in person, which may be an issue. Additionally, online stores may be tricky about returning the ring. There is also the issue of sending a valuable object in the mail to worry about. A third option is to purchase the gemstone separately and pay a jeweler to set it in a band. This is a smart way to go because it gives the ring buyer the best of both worlds: the gemstone can be purchased fairly cheaply on its own, but the buyer still gets to see what the ring looks like on its own. This may be the least expensive option. Note that returns may also be problematic with this method, though.